While preaching at the rally at the Montavilla Church, Lee Turner asked me to conduct a gospel meeting at the Minnehaha Church in Vancouver, Washington. I did this in August of that year and Lee and the church suggested that we move to Vancouver on a permanent basis. After some discussion, we moved from Sutter to Vancouver and took the leadership of the Minnehaha Church of Christ. That was 1955. We remained for exactly 35 years, right down to the Sunday. A more detailed history of the Minnehaha Church is located on this link. A key to this long ministry is that about three sermons out of four were expositions of Scripture. It built the truths of God into the lives of the members. If I were to begin again today, I would do exactly the same thing. I have recorded my views about expository preaching and the 39 minute presentation can be heard on this link. Carol and Joy were born in Vancouver. At first, Joy was mainly silent and Carol spoke for both of them. That totally cleared up after a few years. Our children were raised at 3008 X Street in Vancouver. We left there more than 20 years ago, but in 2002, someone asked me if we still live on X Street. People remembered that address very well. There was a time when night-to-night meeting were better attended than they are today. Oddly, my first meeting was in Daly City, near San Francisco, California. Vyron Fender was the preacher and Darrell Reyman led the singing. Carson City, Nevada. Darrell Reyman. Central Valley, California. Marion Hull. Eugene, Oregon -- West Broadway. Larry Jonas. Eugene, Oregon -- Norvale Park. Steve Holsinger. Las Vegas, Nevada. Darrell Reyman. Portland, Oregon -- 64th Avenue. Charles Crane. Portland, Oregon -- Duke Street. Bruce Oberst. Portland, Oregon -- Duke Street. Gary Flom. Salem, Oregon - West Side. Oren Knowlton. San Jose, California - Burbank. George Parker. San Jose, California - East Side. Warren Phelps. Shasta Lake, California - Deer Creek. John Bell. Spokane, Washington. Gene Boulton (twice). St. Helens, Oregon. Myron Wells. We put together a team of planners and held retreats for a decade or more. There were youth retreats, singles retreats and retreats for married adults. 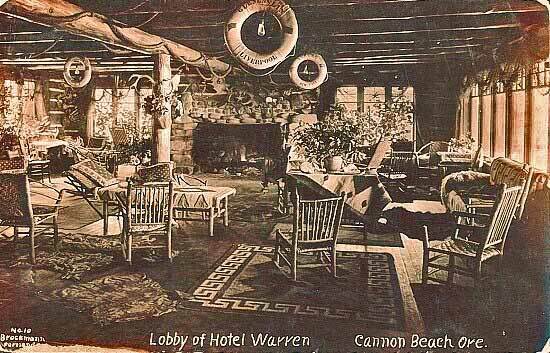 The Warren Hotel from a 1924 Postcard. It still looked this way in the 1960s. Among the picturesque grounds that we rented was Grace Haven, the old Warren Hotel at Tolovana Park, south of Cannon Beach. We rented all of the surrounding cabins as well as other housing in town. The old hotel had a great history and Vern Shultz from Warrenton was often on hand to regale us with stories about the building from its earliest days. 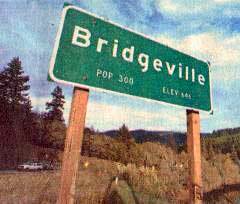 An event that our children readily remember is our stay in Bridgeville, in northern California. It is about 20 miles south of Eureka and inland on the beautiful Van Dusen River. Settled in 1865, the village was once a stage coach stop with a 24 room hotel. A group of wandering young people had just become Christians. They had wintered on a farm in the area. Among them was Bob and Smee Plank. Larry and Joyce Jonas had spent several weeks there to confirm the group in the faith. We moved in right after that and lived among them for several more weeks. 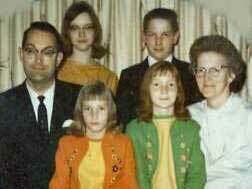 In following years, several of the young people matured and became church leaders. That was 1969. In December of 2002, 80 acres in Bridgeville sold on eBay for nearly $1,800,000. The Sacramento Bee carried a feature story about the sale in its Christmas Day edition. We turned up the speed of living for about a year, beginning in 1979. We took the leadership in establishing a new church at Yakima, Washington. It is a four hour drive from Vancouver. Sometimes Lois could trim that time a bit. We got an apartment at Yakima and left Portland after my Bible College class on Friday, arriving in time to make a call of Friday evening. I used the travel time to read and reflect and Lois drove. It was absolutely beautiful watching the seasons change in the Columbia River Gorge. Our expenses were paid by a cooperating group of churches that wanted to get the congregation planted. Don and Corinne Hill of Yakima did a great deal towards getting the congregation started and Tommy and Jeanie Wright also helped in the project. We had Sunday lunch in the car, headed back to Vancouver where I would bring the evening message at the Minnehaha Church. We stopped the trips for about a month while Yakima -- and all of eastern Washington -- dug out from under the ash of the Mt. 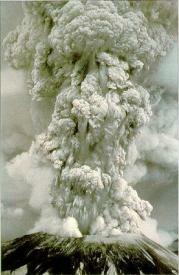 St. Helens eruption. The church-planting project was partly successful. Bruce and Carol took the helm when we stopped going. Our Carol had married Bruce Rodda, a graduate of Northwest College of the Bible. Joy married Dave Kubow, a student at the same school. About 1977 the late Glen Snogren and I combined forces and established the I-5 Toastmasters Club. During the time that I was an active member, I won a number of trophies in speech and speech evaluation contests in regional competition. I have a shelf full of these awards. It was 1979 when Jerry Dillion of Sacramento convinced me that microcomputers were the wave of the future. Jerry generously put together a unit for me that may have been among the very first micro computers. From there I have upgraded with the industry until the computer has become the chief tool that I use at home for creating lessons, research and outreach to the world. The printing and the computer combined to allow us to print on demand, rather than print and store the output. We have very little literature on hand now, preferring to print when the item is needed. We have a print-on-demand site available where several things can be printed free of charge by the inquirer. This is the link. During the 1980s Lois and I became semi-active in the local political scene. Lois was elected as the Precinct Officer from our area and I became treasurer of the County Republican Party. We were sent as delegates to the State Republican Convention five different times. It was an interesting and informative experience. Sometime during the 1980s I became an elder, joining Ron Edson and Stacy Marriott in that role. There was concern among a few in other churches about a conflict of interest, but it smoothed out my work as a preacher in the congregation. I recommend the move. 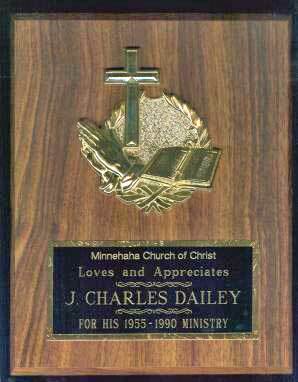 I resigned from leadership of the Minnehaha Church, at the end of 35 years of continuous service, in 1990. I was 60, and my eyesight and hearing were declining some. I had switched to manuscripting most sermons, not an ideal way to speak. My voice would shut off mid-sentence and without warning. As I write this late in 2002, my voice has returned to normal and my night vision has improved markedly. My plan was to give the church 13 weeks notice that I was leaving, but no one believed me. Each Sunday morning sermon began with the words "This is message 13 (or 12 or 11, etc.) in the countdown to my departure." At about number five, someone began to think that I might be serious. The church gave Lois and me a wonderful party with friends coming from near and far. Paul Reyman phoned in from Africa. I think that Tammy Lewis was the moving force behind the party. We were given the plaque as a reminder of our years of service. A cash gift went a long way towards paying for classes leading to my graduate degree. Your congregation is saying "Good-bye". There will be tears in many an eye. Do not do justice to how I feel inside. You've been as faithful as the ocean tide. Or just being there to give a ride to someone. And then only the surface would be touched. Only He knows how often or how much. You gladly filled in, whatever the need. You were there to comfort us when they were gone. That were with you right from the start. Safely tucked away somewhere in our hearts. And even of parties and dinners. That have warmed our hearts through the years. With a firm handshake and a friendly smile. But oh, the valleys we've all walked through"
And the Love of Jesus was our only light. And the valleys were so hard to bear. Only making it through with His guidance and care. Is as sweet as the fragrance of this bouquet of mine.